The premier League has unveiled the official match ball for the 2018/19 season. Named 'The Merlin', the ball marks Nike's 18th season as the official supplier for the Premier League and will be used for the first time when the new season gets under way on the weekend of 11 August. 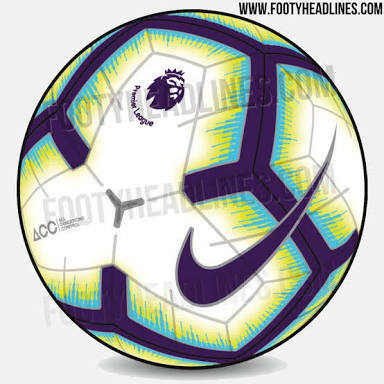 Nike's new design is 'the most advanced yet,' according to the Premier League's website, and will be the first ball ever to have just four panels. "Where there were once 32 panels to a ball, the new Nike Merlin will have just four, a world-first," says a Premier League press release. "Fewer panels mean fewer seams, eliminating hard spots and opening the ball up to more sweet spots for Premier League players to shoot or pass with more accuracy. "The ball’s colours, a mix of white, black, purple, blue and yellow, will help players identify more easily which way it is spinning, when it will drop, and how fast it is travelling. "This will give them crucial milliseconds to decide what magic they will apply next." The fixture list for the 2018/19 season will be announced on June 14, the same day as the World Cup begins in Russia.